In our column, “Cider Loves Food,” contributor Meredith Collins (blogger extraordinaire at Along Came a Cider) is looking at different cuisines and finding the perfect ciders to help take your meals to the next level. No matter what the weather looks like outside, spring is here (we’re just going to keep saying that until it comes true). One of my favorite things about spring is brunch season — from Easter to Mother’s Day plus the many graduations at this time of year, brunch seems more popular than usual. Whether seated in a cozy corner of someone’s home, or watching the world from a sidewalk table, brunch is the meal for relaxed socializing over delicious dishes and tasty drinks. Brunch food is often hearty breakfast fare, sometimes enhanced with a little twist, and I think cider can be — and should be — part of that creative flair. 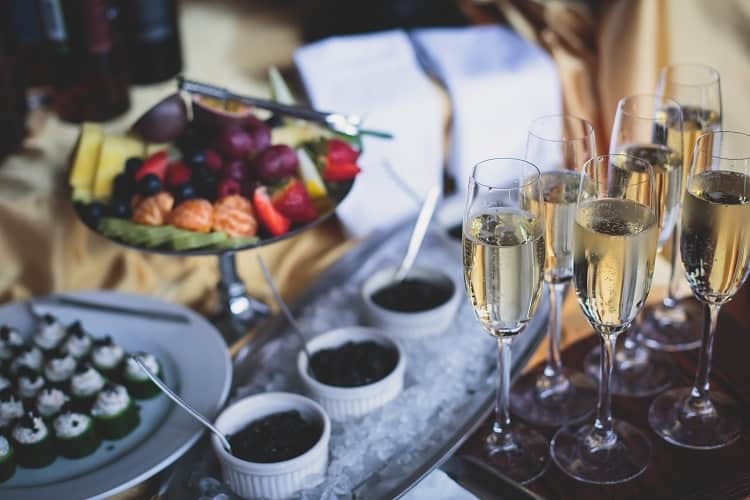 Brunch and cider go well together for a few reasons: First, it can easily take the place of a sparkling wine at the brunch table. Cider instead of Champagne, cava, or prosecco just makes sense, because you can still get those fruity bubbles at any point on sweetness/dryness spectrum. But, the lower alcohol level means that a second flute of cider does not turn a brunch morning into a sleepy one. Now, let’s talk about specific cider and brunch pairings! Back to bubbles, because that’s what I really want to talk about. Bubbles lift up rich dishes and bring out nuances of flavor. They literally mist flavor up out of the glass, and when consumed with food, bring more of those food flavors with them. The first cider type necessary for brunch is anything twice fermented in a Champagne style. Pair these ciders with delicate side dishes, like fruit salad and smoked salmon. Castle Hill Levity: This company makes a few natural sparklers, including Terrestrial and Celestial. But lately, I’ve been going crazy for the acid-forward Levity with notes of orange and passion fruit, crafted in buried terracotta vessels and aged on the lees. What is brunch without carbs? It’s not brunch at all in my book! 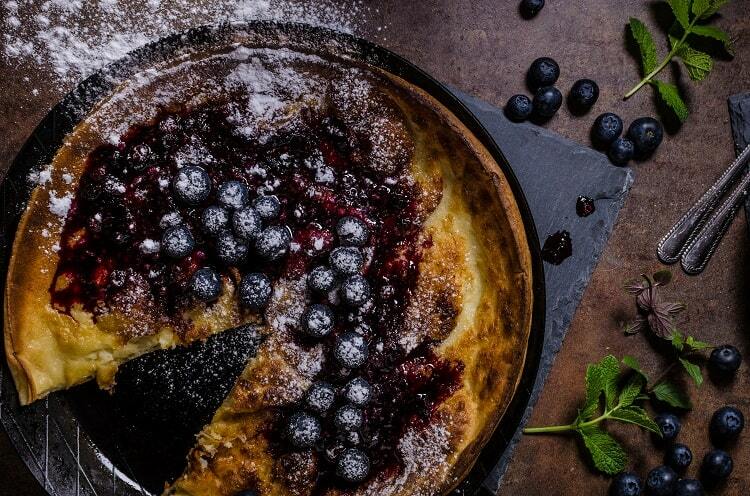 Lately, I’ve been really excited about Dutch Baby, a light and fluffy pancake variant that’s actually a very large version of a popover. They can be made savory or sweet and either way, they are a delightful interplay of stretch and crunch. My recommended pairing here is as classic as they come: Mimosas. Whitewood Cider Co. Olivia Newton-Jonathan Cider Blend: This semi-dry is perfect for a fresh-squeezed grapefruit mimosa. Whetstone Ciderworks Orchard King: A tart dry cider is what you need to give some backbone to a traditional O.J. mimosa. I like having these two versions because everyone has a different notion of the ideal balance of sweet and tart. These two ciders are both very acid-driven in their profiles, but they’re just different enough that they each pair with their respective juice very smoothly. For the main dish, you cannot beat shakshuka: It’s bright, warm and savory. It doubles down on the umami, which makes it another stellar food for pairing with cider. 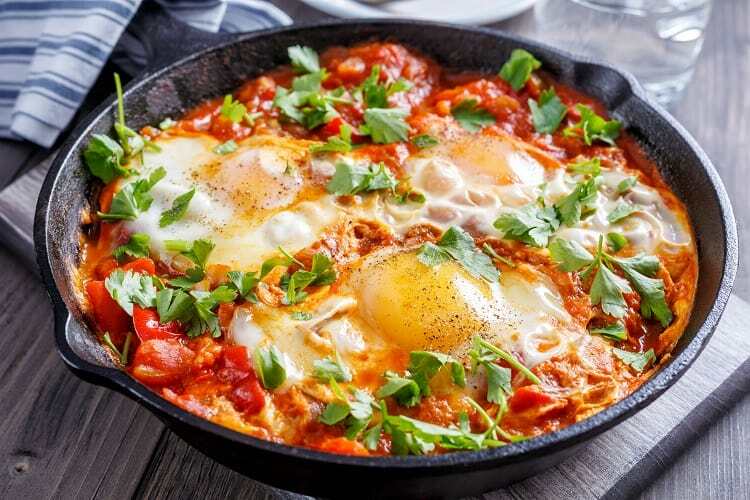 Versions of shakshuka come from the Middle East and North Africa, and lately, it’s become a hip brunch staple in all-day cafes and breakfast spots. Eggs are poached in a divine tomato sauce and are frequently topped with cheese and herbs. There are some great recipes online, if you want to tackle making it! Shakshuka has big flavors, so this is the dish to pair with the most emphatic and fun ciders in your cellar. I like to go a little sweeter and more full-bodied for a cider pairing here, and this is a great place for modern fruit-infused ciders. 2 Towns Pacific Pineapple: There are a ton of ciders that take advantage of additional fruit for new and different flavors and additional sweetness or richness — and this one does so especially well. Juicy Costa Rican pineapples blend gorgeously with Northwest apples in this unfiltered tropical party. 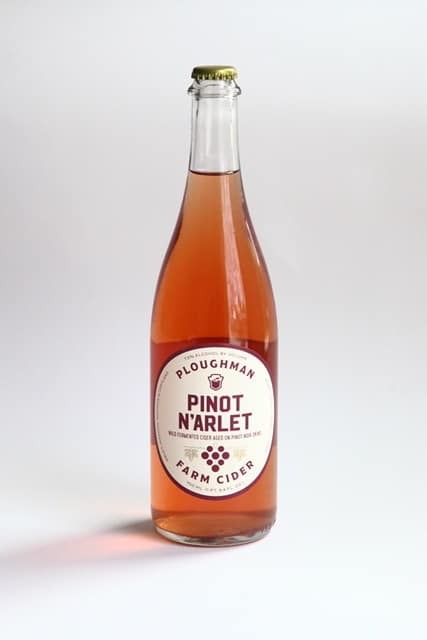 Ploughman Cider Pinot N’Arlet: This cider is a wild ferment, and that wildness comes through in the cider’s flavors. This cider was aged on the skins of local pinot noir grapes, giving the cider an extra dimension of fruit flavor, as well as some lovely color. I like it as a pairing for savory Shakshuka for that sweet savory contrast, each with the intensity turned way up! With all of the cumin-rich tomato broth, this brunch is begging for some potatoes to dip right into the shakshuka. I recommend keeping it simple with roasted spring potatoes with salt and rosemary. Ideally, choose a mix of fingerling and red-skinned potatoes, quarter them, toss with olive oil, rosemary and a pinch of table salt then roast them at a high temperature until they soften up. Once cooked, sprinkle generously with flake salt. Even a humble side like this deserves a cider pairing of its own. This dish may have a very small number of ingredients, but what’s there balances well, just like rosé cider, its perfect pairing. Rosé cider is taking the cider world by storm right now — it’s fun, springy and different. Virtue Cider Rosé: The zingy fruitiness of the cider contrasts the salt and crunch of potatoes beautifully. 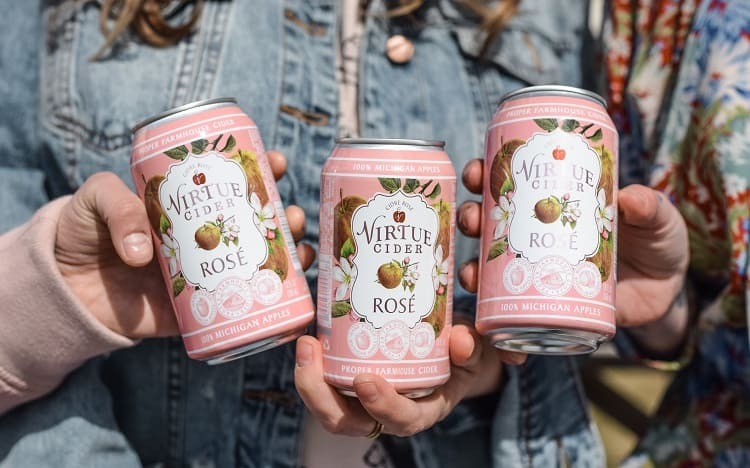 Though some cider companies turn their ciders pink and call it a day, Virtue borrows from winemaking traditions — using heirloom Michigan apples aged in French oak barrels — and really nails the crisp, dry flavor profile that’s made the wine version so popular. I hope these recommendations reveal just how flexible cider can be for the best meal of the week: brunch. Between cider’s range of sweetness to dryness and its wonderful effervescence, it is the ideal drink for brunch. How have you incorporated cider into your brunch traditions?